This residency consists of music education workshops led by the world-renowned group Altan for communities in West Donegal. Throughout the residency Altan will compose a new work for public performance in collaboration with Donegal Youth Orchestra as part of the Earagail Festival, July 2010. Sharing Stories in a New Media Age is part of the wider IFI funded Sharing Stories, a two year cross-border community film project in County Donegal and Derry City organised by Donegal County Council Regional Cultural Centre and The Nerve Centre Derry. The sharing stories project includes 19 completed short films. They feature an incredibly varied range of topics and people and taken together, provide a very rich tapestry of life, past and present, in Donegal and Derry. And if those were the seeds, the actual kernel of the band was the music and personality of band founders, Belfast flute-player, Frankie Kennedy, and Gweedore singer and fiddler, Mairéad Ní Mhaonaigh. As soon as anyone met them and heard their unique music in the early eighties, whether in a large noisy festival session, or in the little traditional clubs of Dublin and Belfast, it was immediately apparent there was a rare power at work. They seemed to be playing their own repertoire, in fact a combination of old Donegal fiddle music (then little known outside Donegal) and of unusual Northern flute tunes, they delivered it with a force and fullness that made it hard to believe there were only two people playing, and that combined with Frankie’s immense wit and playfulness and Mairéad’s beauty and down-to-earth charm made an irresistible package. It quickly became clear to them and others that they could go places. Gradually the duo grew organically into a band in the mid-eighties, forged in the bustle and crack of a thousand late-night sessions and festivals throughout Ireland – the repertoire gave Altan (the name was taken from a deep and mysterious lake behind Errigal Mountain in Donegal) a totally unique stamp, while there was an undoubted inspiration from the great Irish bands such as the Bothy Band, Planxty and De Danann. Altan’s commitment to good natured fun was second only to their commitment to excellence in all things musical, and so the band members who were gathered in were top-notch. Altan has always been a virtuoso band. Earliest was bouzouki-player, Ciarán Curran from Co. Fermanagh, a session and festival veteran, nephew of fiddler, Ned Curran, and close friend of fiddler, Ben Lennon, and flute-player, Cathal MacConnell (of the Boys of the Lough). Like all accompanists of the time, Ciarán had invented his own style on the instrument, and his playing lies at the heart of the Altan sound, though like all great accompanists, the very perfection of what he does makes it difficult for the casual listener to notice! With the inclusion of guitarist Mark Kelly in the mid-eighties Altan truly became a band. Though all band members have always had a deep knowledge and love of other musics, as well as Irish, ranging through rock, blues, jazz and country to classical, Mark, more than the others, had actually played other styles, and from the start he showed a gift for tastefully bringing fresh rhythms and chordings to the band arrangements. Mark and Ciarán were heard on the ’87 album Altan, which, though not officially a band album, inaugurates the band’s studio sound. But it was live work in ’84 -’85 that marked the turning-point for Frankie and Mairéad, encouraging them to give up their teaching jobs and go professional. Particularly influential were short trips to the United States in those years when they played concerts in New York, Minnesota, Madison, Portland and Seattle with Derry guitarist, Dáithí Sproule, a Minnesota resident and like Ciaran and Mark, an old friend. Dáithí had played a big part in an earlier wave of development in the music, being one of the very first people to adapt the guitar to old Gaelic songs (many of which he learnt in the Gaeltacht of Rannafast, just a few miles from Mairéad’s home in Gweedore). These US concerts, played in clubs and sometimes in noisy Irish pubs, where people were expecting a very different sort of music, convinced Frankie and Mairéad that no-compromise traditional music played with heart and drive could win over any audience anywhere. In succeeding years, the band recorded albums for Green Linnet, all of which won accolades and awards and appeared in the Billboard charts – their collaborators on these albums were of the highest caliber and it shows: Donál Lunny, Brian Masterson and Steve Cooney in particular made great contributions over the years. Another friend played with the band for several years, master fiddler, Paul O’Shaughnessey, a dazzling and fiery player with a deep knowledge of Donegal music. The two-fiddle sound stuck, so when, as Altan toured more and more widely, Paul had to leave due to pressure of work, his place was taken by another great young Donegal fiddler, Ciaran Tourish, a player with a special love for the weaving of spontaneous harmony and counterpoint round the melodies of the other lead players. Through the years audiences are continually struck by the genuine camaraderie and mutual respect among the members of Altan, and this has been vitally important to the band themselves as well as producing a marked effect on live audiences. So when a final element was added to the sound in the early nineties it was another old friend, though not old in years, since the band had known him and his music since he was a boy. Accordion-player Dermot Byrne, another Donegal man was weaned on the music of an older generation of Donegal fiddlers, the Doherty’s, the Byrne’s and the Cassidy’s. While Dermot’s status as a complete virtuoso had been secure for many years before he joined the band, it is also part of his gift that he is able to blend seamlessly with other musicians, so Altan just seemed to get tighter and tighter as a performing unit. Sadly, in the early nineties Altan was dealt a devastating blow, when band leader and manager, Frankie Kennedy, at the height of his powers as a brilliant and innovative flute-player and just when his and Mairéad’s musical dreams were being realised, was diagnosed with cancer. Through a long illness, the band, at Frankie’s insistence, continued to tour and perform with Frankie’s participation whenever possible. No words can describe the effects of his illness and loss on the band, but he continues to be a presence and inspiration in Altan’s life and music – more than anything else, Frankie was a lover of life and perhaps the deepest message of all music is that life goes on – no matter what. Altan’s international status and success found a very practical recognition when they were signed in 1996 to Virgin Records, the first Irish band of their kind to be signed by a major label. The band gained gold and platinum albums in Ireland and toured larger venues, literally throughout the world, with tours in Japan, Australia, New Zealand, Europe as well as regular successful U.S. tours. 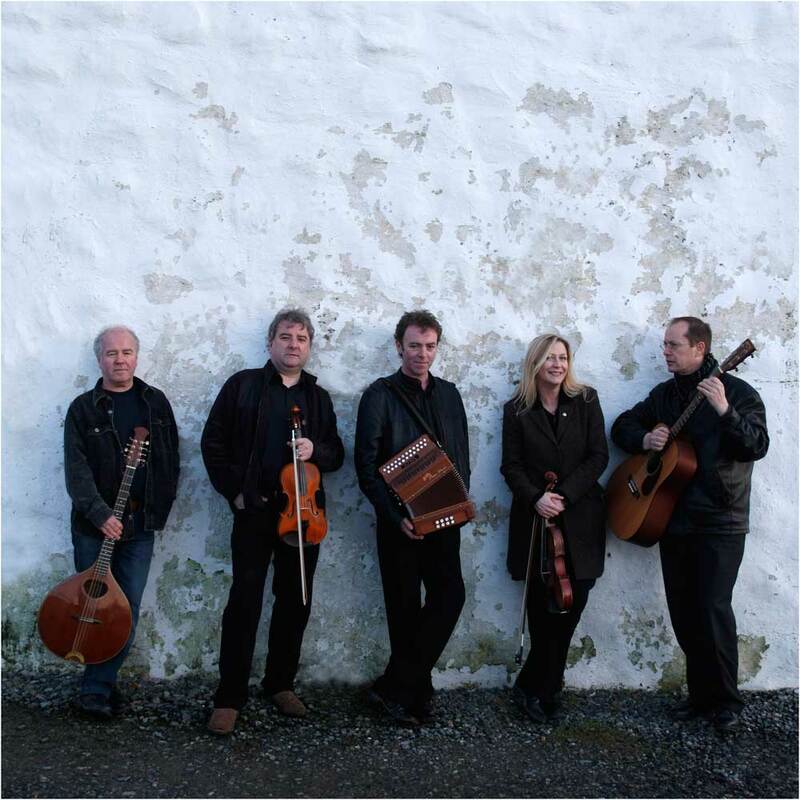 In spite of a hectic touring and recording schedule, Altan continue fresh in their vision of bringing the beauty and joy of traditional music to audiences everywhere, and have always promised themselves to continue as long as it’s fun – fortunately, it still is.